While this plan is respectful of its surroundings and sensitive to neighborhood character, it is also a distinct place with a powerful image. 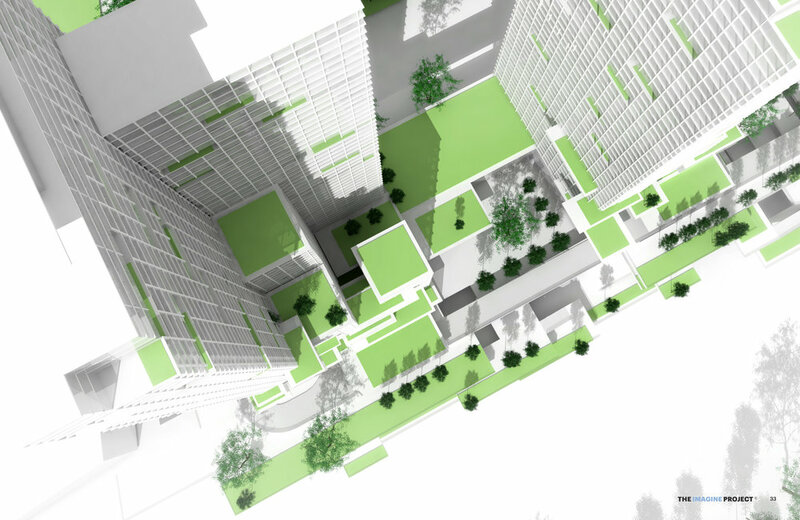 The workings of the plan address a number of site constraints and city requirements, woven together through a complex network of buildings and infrastructure. But the entirety of the plan can be understood though a series of simple ingredients. The residential towers range in height up to 60 stories and rhythmically rise from the lowest to the tallest. The towers are also massed in a way that produces gardens that bring the park from the lakefront through the terraces and up into the sky. The Terraces are horizontally scaled to command presence below the tall towers. 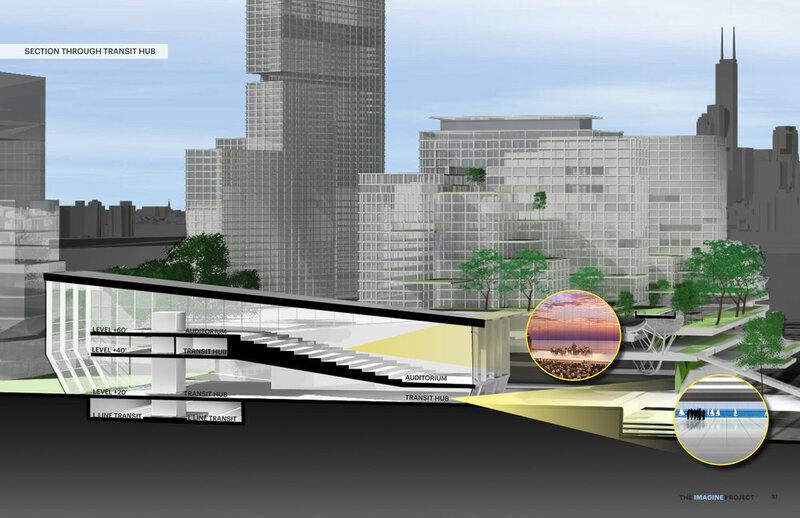 The tower massing steps down to the scale of the Transit Hub which also provides view corridors to the lake from upland campus and residential buildings in the plan. Like other great waterfront streets, the Towers and corresponding open spaces form a large and memorable image. The vista of the whole is more important than individual buildings, and the unity between the towers is an important consequence. The views form the towers to the lake and down to the terraces is meant to be dramatic. Shown here are two approaches to the overall tower design, each very different in layout but similar in the effect and image of this place. Transit drives development and in a place like Chicago that’s even more true. With 21,000,000 sf of development there will be a large ridership demand here. Further the surrounding neighborhoods will add to that demand. 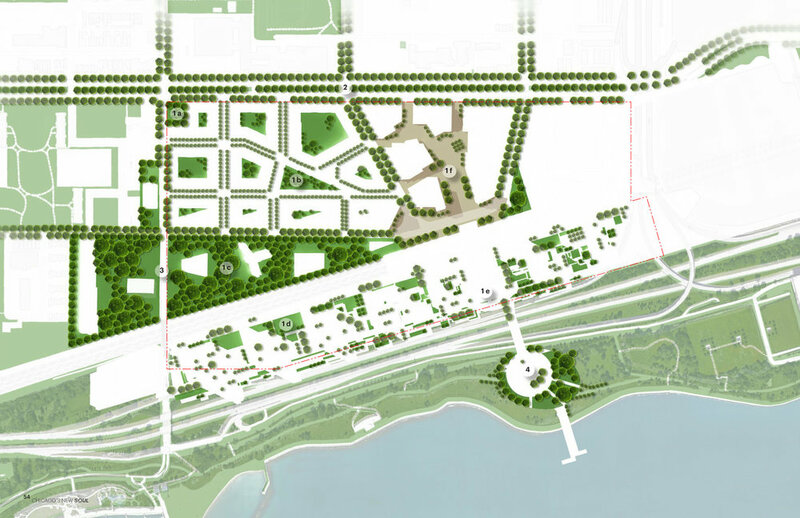 The concept of the Transit Hub is twofold, to reinforce the lakefront location and to provide easy access throughout the plan and neighborhood. This page shows the purposeful framing of lakefront views for riders. The connection to the lake is strong. 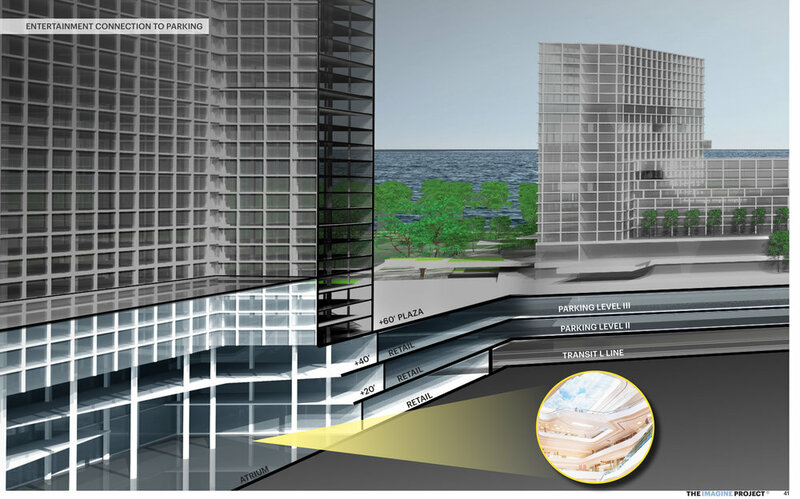 There is a proposed Hall on the upper levels of the Hall and Terraces that also has a powerful lakefront orientation. This public room can be individually operated, part of the campus, part of the cultural park or part of the entertainment venues. Like many of the Loop Stations or a small version of New York’s Grand Central, the Transit Hub operates on multiple levels. Part of this is to facilitate crossing tracks but translates into easy connections either down to the street, straight into the Hub or up and into the Entertainment District and connection to McCormick Place. A particular requirement of the city is to preserve the last remaining building from the former Michael Reese Hospital. The cultural park defines this site’s relationship to the railroad by considering a rail-park. 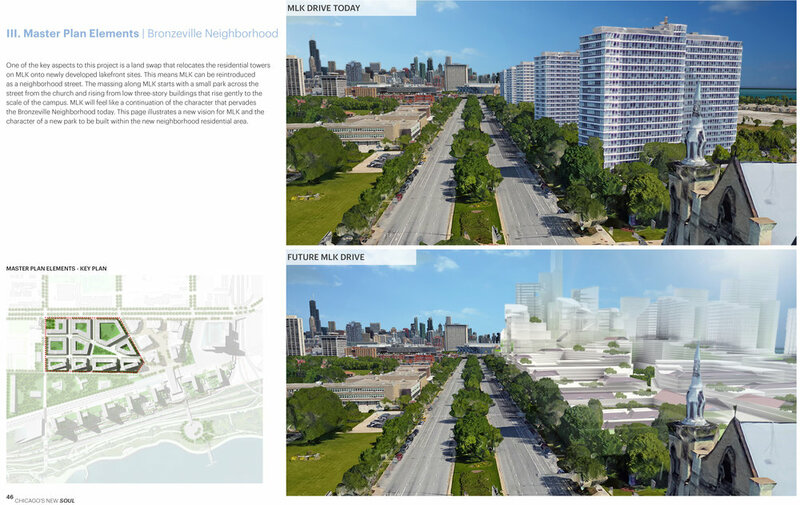 The Bronzeville neighborhood is brought into the park by extending Rhodes Avenue to the transit station. 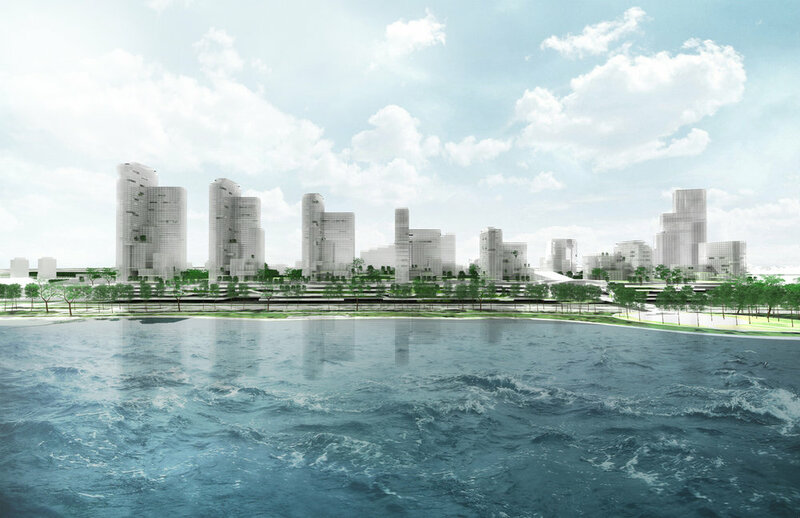 This creates a large triangular park that brings together preservation, rail and neighborhood. There are additional park buildings in the composition to allow for a variety of cultural and neighborhood uses. In addition to the large, central park, the Imagine Design team focused on maximizing public green spaces. Consistent with our goal to make the most walkable community in Chicago, the constellation of parks provide the threads that connect the many elements we have planned for in the Imagine Project.